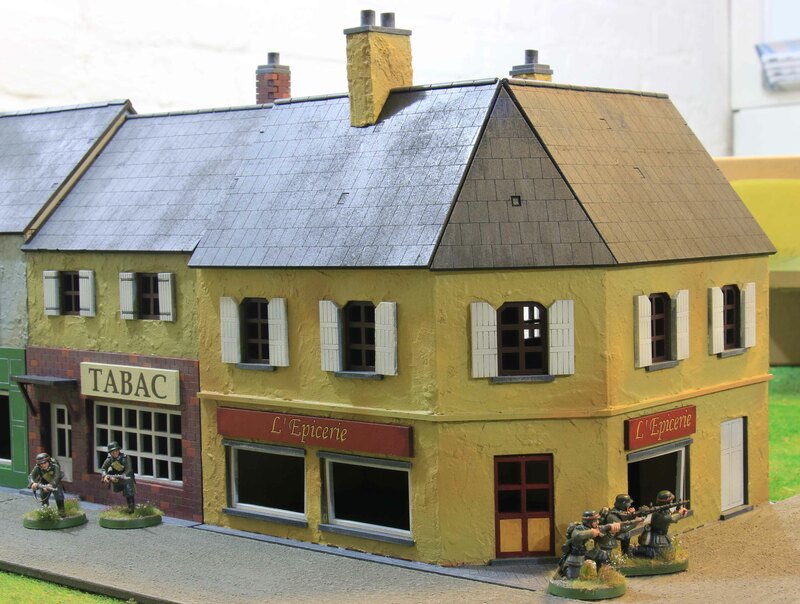 So following up on the last post, some more Normandy really estate. 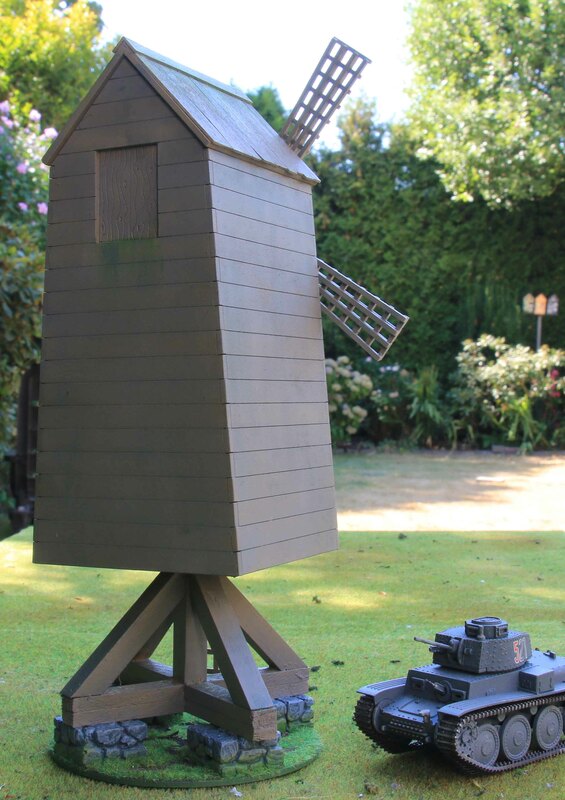 First up two free-standing houses from Sarissa Prescisson. I have to admit, that while working on these, I could not decide if I liked them or not. They offered some nice details, like the brickwork on the ground floor level or the nicely laser cut shutters. 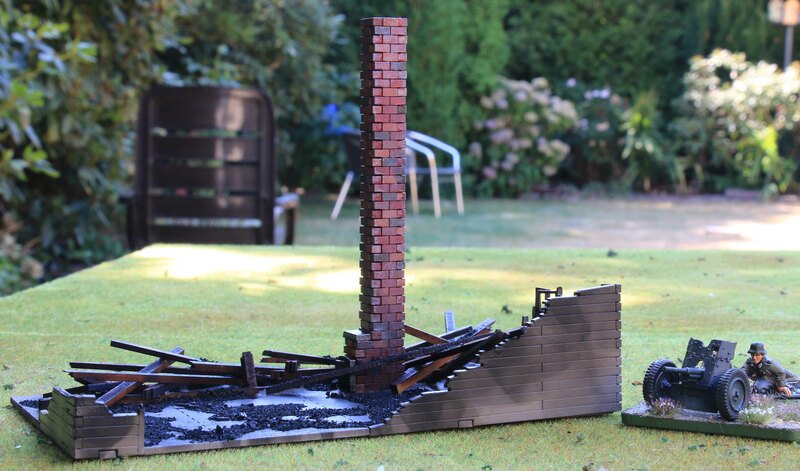 On the other hand some things were a bit basic, like the very simple chimney stacks, the chimney of the destroyed house actually ending nowhere or the side walls and floors forming small ledges and buttresses. In the end though, one also has to see that they cost around 15 GB£ each and for that price tag they are fine, if you are willing to put some effort into these. 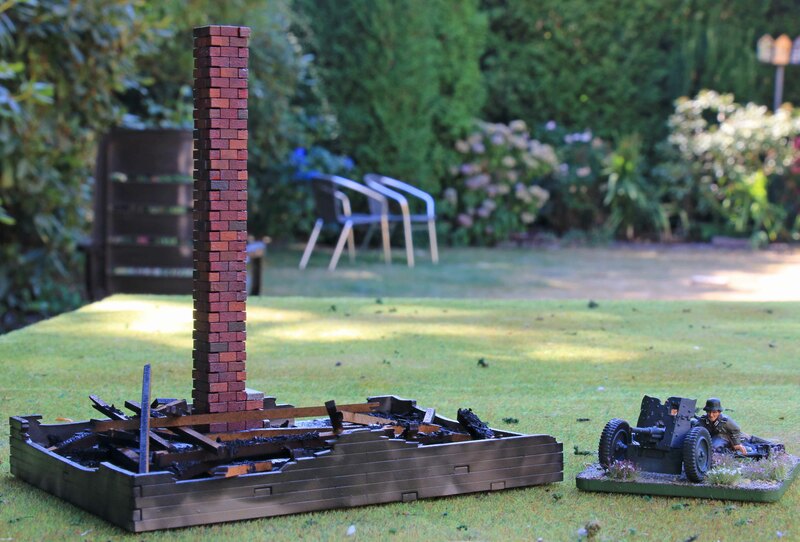 I added some filler to the walls, the bricks were painted in different colours to give them depth and I added a fireplace from Ainsty Castings (which I can unfortunately not find on their website right now). The thin spread of filler to mimic plaster shall now become a standard for MDF buildings, since I feel it gives them a more organic look and makes them look less like MDF. 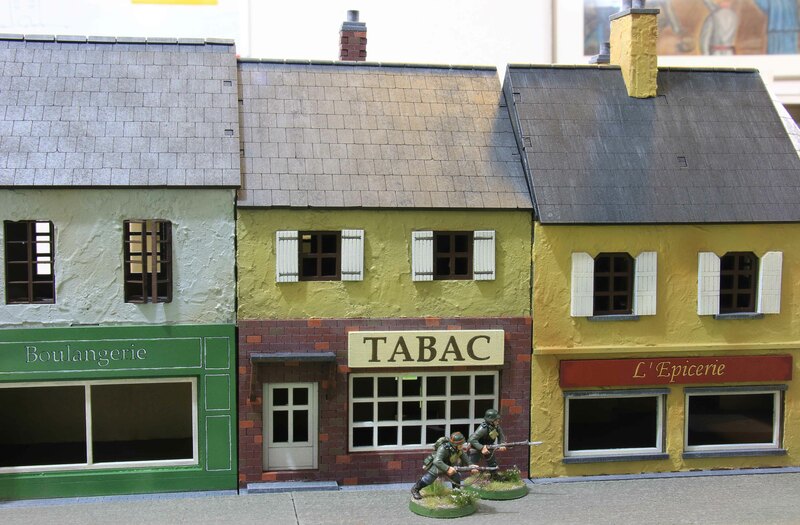 These buildings are meant to specifically complement my earlier Normandy buildings that represent buildings at the edge of a town or larger village or small farms or hamlets. 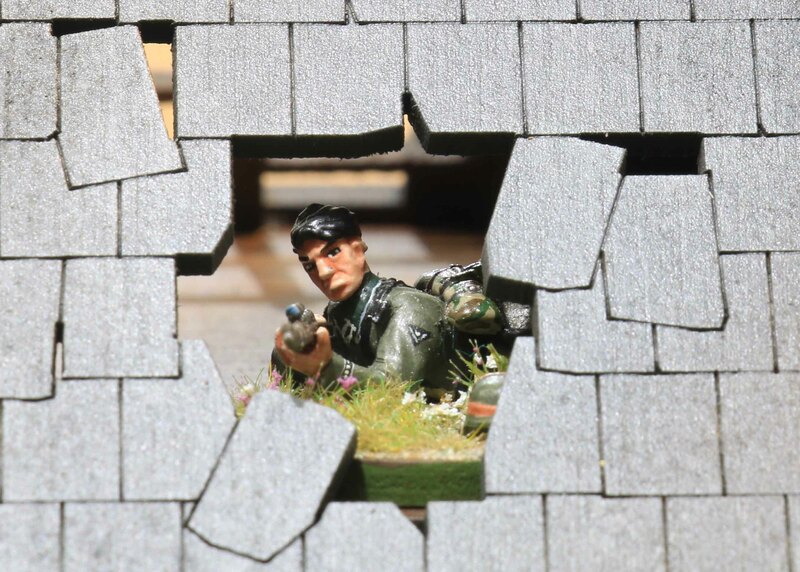 Now a couple of years back when I did the others I got a lot of fire from one user on The Wargames Website for doing the shutters and doors a bit more colourful. While to this date I still do not believe that every house in Normandy has them painted white, looking at photos from Normandy it seems that this is indeed the preferred colour for shutters and doors in that region of France, So I decided to paint them all white to raise the ratio. But now on to the other set I work on last week and to be honest… I can not stress how much joy I had working on these. 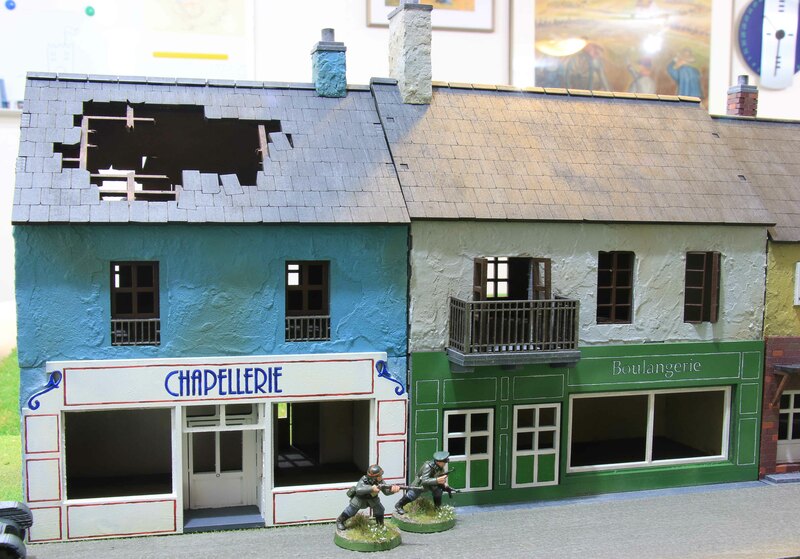 This is a set of French village buildings designed to form a row of houses / stores by Charlie Foxtrot Models. Now there are two things that made me like them so much. One is the level of detail put into them and the other is that they are all unique. You could have a street like this by designing a basic building and just adding different facades and signs to it and be done. But assembling them you already see that this was not the case. Each one is designed on its own. They all have slightly different dimensions and the windows and shutters are different, too. The angle of the roof is not the same on them all and neither are the chimneys. All in all this leads to a very natural as opposed to the very cookie cutter look we often get on the tabletop. And building these houses, it makes you want to see the end result, see it all come together. And this was a massive joy. As you might have noticed, the roof on the Chapellerie is damaged. 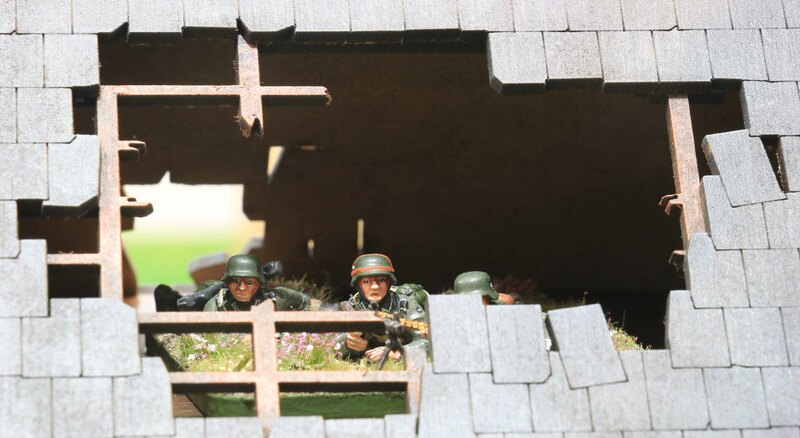 One side has a larger hole in it, big enough to provide a nice position for a LMG or HMG team (or gun if your Gebirgsjäger are in the mood to dismantle their gun and carry it upstairs), the other side a smaller one that makes any sniper happy. Now there is another building in the serials which is actually designed to form the left end of the row and which I will eventually get myself. If for no other reason, just because the end of the row looks rather blue right now. Now there is one small “problem” if you like with these and that is that all the buildings extend to the left from the grocery. Now while you may think “what is the problem, simply put one on the right”, the grocery has an outside staircase, which would be blocked by the depth of the other buildings. I voiced that to Colin (the owner of Charlie Foxtrot) the other week and while he had previously not thought about it, he is now thinking about adding another building to the line that would allow the row to be extended to the right as well. So I guess we will see even more buildings in this line. If you want to see more details on these builds, please remember that these photos lead to larger versions. 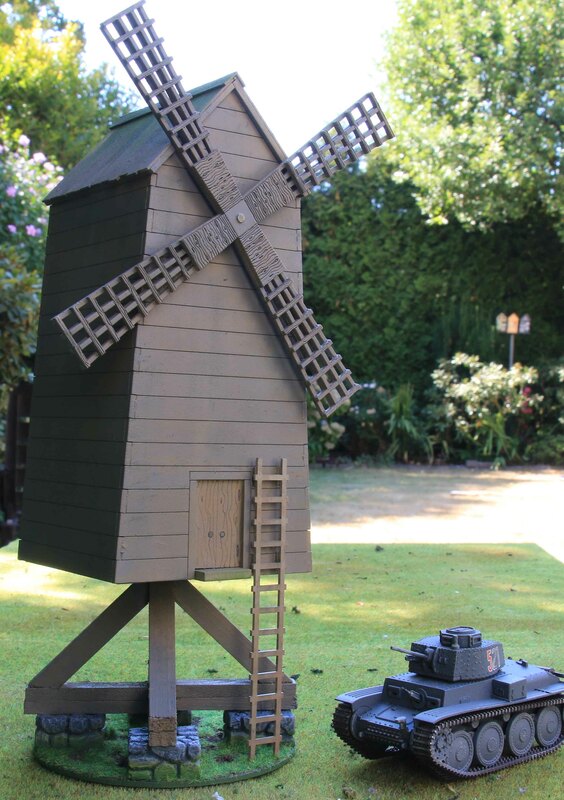 Anyway, I think that these buildings should give me lot of mileage, since they could be used for virtually anywhere in France, making them suitable for both 1940 and 1944. 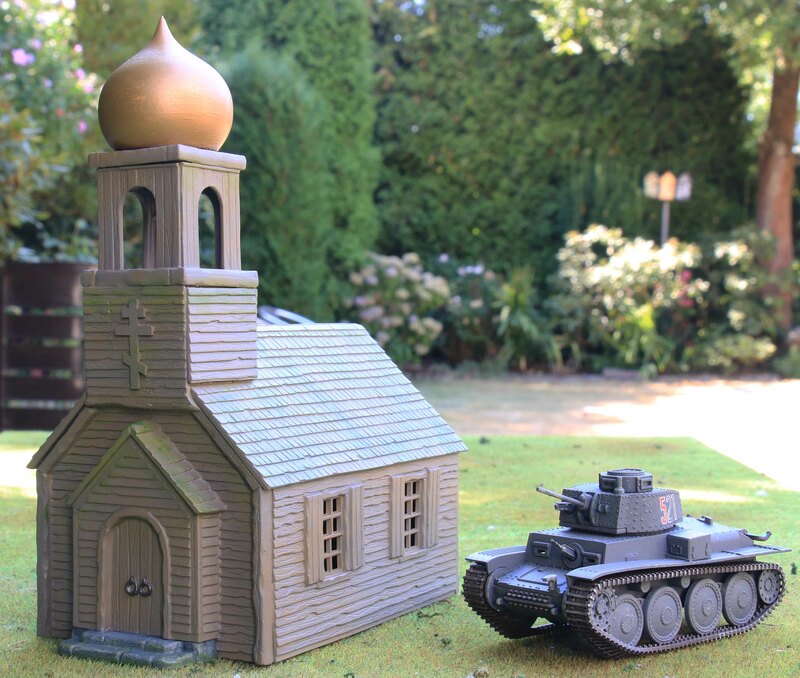 I hope most of you who are interested in the period have already seen this, but if not, I wanted to point you to a Kickstarter for Hungarian Infantry in WWII in 28mm. I know there is already another company out there producing WWII Hungarians in 28mm, but to be honest… one can never have enough diversity. And I got some samples of their Hungarians when the minis from their last Kickstarter were delivered the other week and the quality is phenomenal. So if this is your cup of tea, go and take a look. As some of you might know, I am living to the far west of Germany in the area that was on the western edge of the Ruhrkessel when the western Allies entered Germany in 1945. As such, I have always been interested in playing games in that region. While much has changed in the last 73 years, there is one architectural aspect that has been there back then and can still be found today. Workers housing for those working in the coal mines or steel mills. These usually are small row houses made from bricks with small gardens or backyards. I found some appropriate models with Timeline Models. 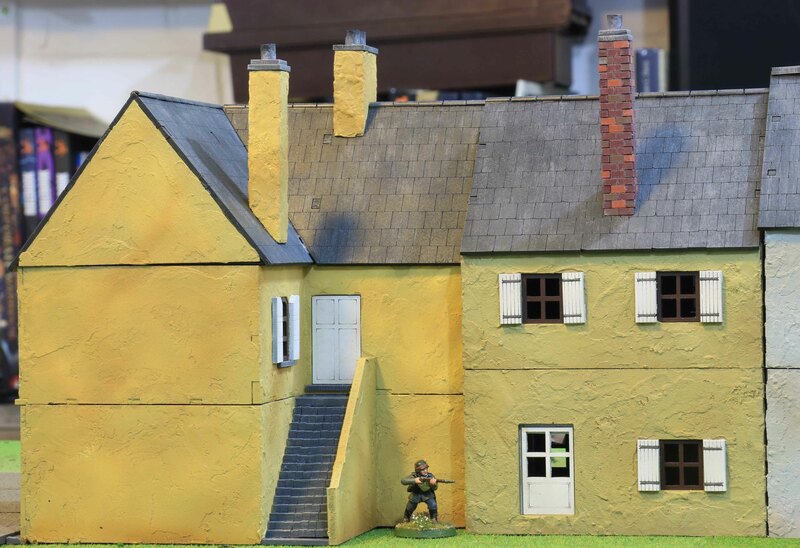 These are actually meant for a Very British Civil War settings, but it seems workers housing in all parts of Europe were not that different. The only let down is, that htese are longer available. 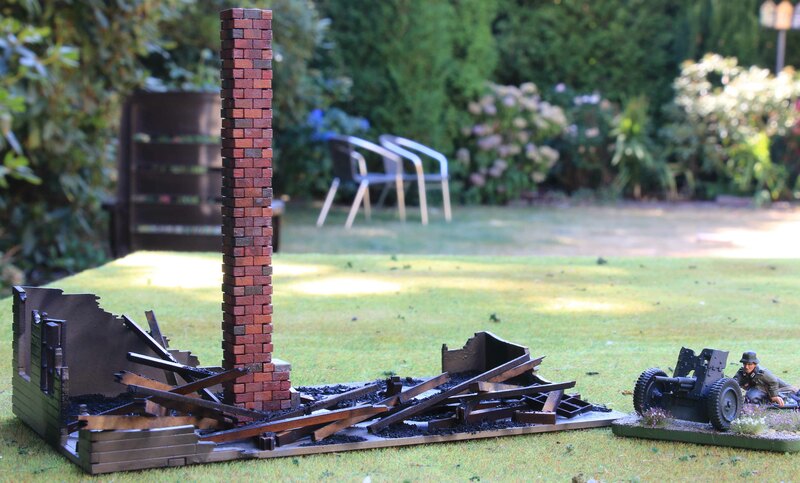 With all their bricks, they were too complicated and therefore too expensive to cut, so they have phased these out in favour of a plain version. Which I think is a shame. So I am still hoping that they will one day make them available again to those willing to pay a premium. Especially since I have three left hand versions and only one right hand version. One of me favorite German vehicles of World War II has been the Sturmgeschütz. Lots of punch, good armor, low profile and usually cheap to get. 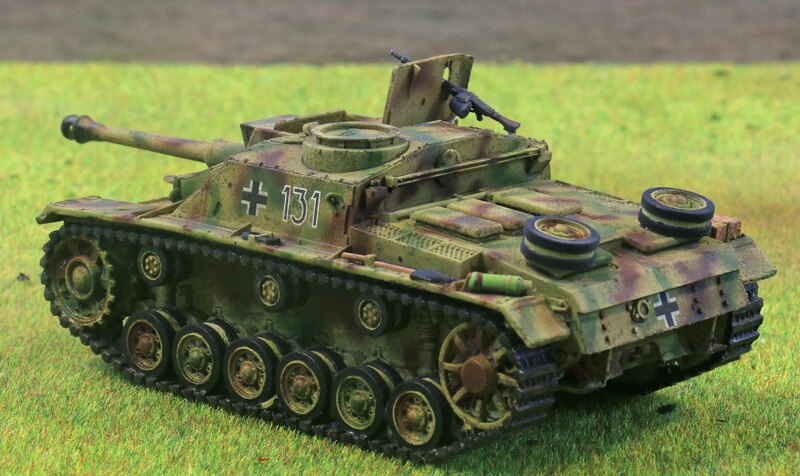 So a battery of StuGs was a must. I already had a G model with Saukopfblende from Tamiya, so when I decided to do a full battery I only ordered two more. But when I started painting them, I decided, that I would rather like all models in the battery to be the same. So I already have a third that I have not painted yet. 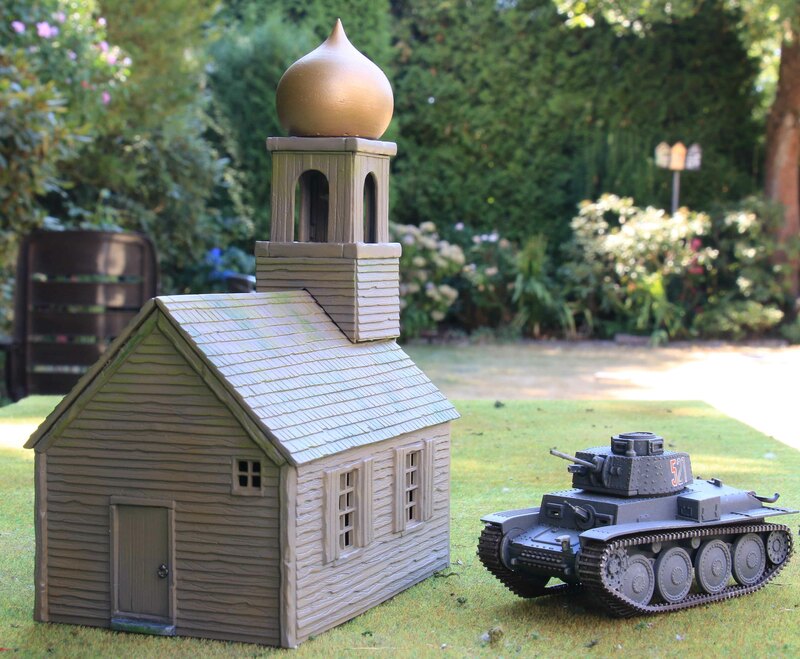 The models are by Blitzkrieg Models. 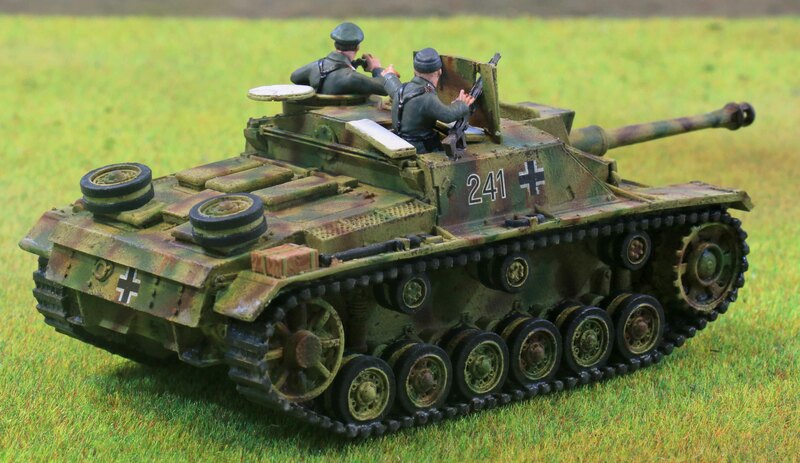 I weathered them like the Jagdpanther and PaK shown the previous days. I added some converted plastic Warlord Miniatures German infantry as crew. 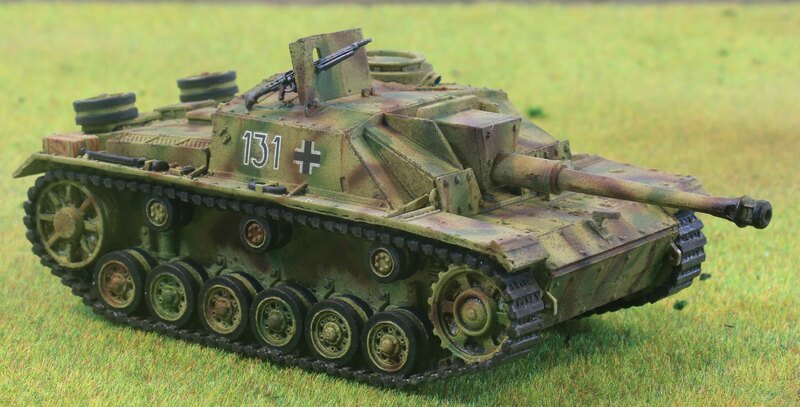 And while I was on it, I also painted a Sturmhaubitze. 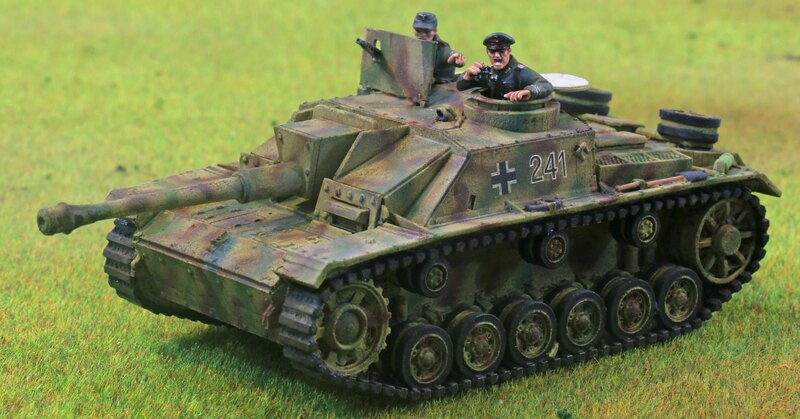 This one is also from Blitzkrieg, with a Warlord commander and weathered the same way. But I chose a slightly different camo pattern for this one.